In this thread, Bob J details some of the insider information of FreeRepublic’s copyright infringement lawsuits, both past and present. There is also a condemnation of the ineffectiveness of FreeRepublic in the past few years, largely due to a single figure that you can probably guess is the cause. Bob J also explains why he is saying what he is. Bob J was a valued member of Freerepublic.com and someone who helped take it to the next level. Despite disagreeing with Bob J on almost every issue, it would be stupid of me to not see how valuable of a person he would be to any organization. The fact that JimRob has been burning bridges like this for the past 13 years one by one is not only telling, but a future predictor of what will happen with tea party groups across the country. The few organizers who are sane or independent from corporate interests will be overridden and driven out by egomaniacs and sellouts. In our next post on this subject, we hope to go over some of the past FreeRepublic protests, including such features as Bob J himself dressed as Clintonocci while protesting Hillary Clinton. Big breakdown of the Freep finances begin here. Bob J knows a lot because he was in talks to buy FR at one point, so we can consider this highly probable information. Despite all of what Bob J has been through, he still won’t throw out unfounded information, which makes what he says even the more likely to be true. 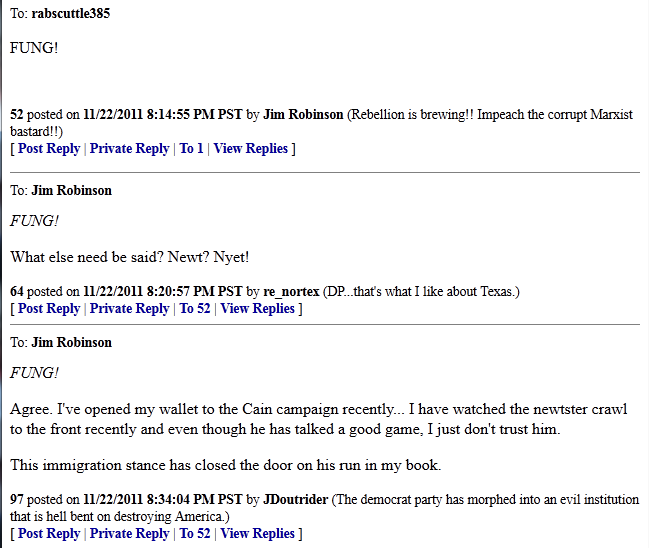 More info from Bob J on the TrueBlueConservative Forum coming soon. For those of us who follow FR, this is very interesting. FreeRepublic.com just had their latest Freepathon, where JimRob got himself another $92,000 to run FR for another three months. You read that right. Now, JimRob just got off of his latest purge, where many fine FR posters were zotted mightily for their inability to thing gay people aren’t the most evil thing that ever existed ever. The problem with purges is you purge the people who donate. So now JimRob is resorting to ever-threatening demands for donations or else FR is gone. 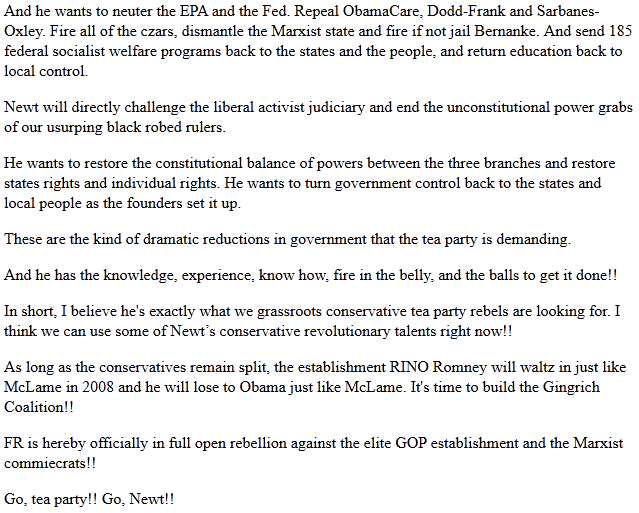 Here are statements from Jim about the future of FreeRepublic.com for those who missed them. They are quite serious. Hey, you want us to get an all new system with all new software and add a few more pricey techs, system programmers and database administrators to keep it all working 100% of the time 24/7/365? Well, start coughing up the big bucks. It’s going to take tens of thousands of donations and many with at least three zeros each after the comma to accomplish the task. And that would be EVERY month like clock work to make the payroll. Once you take on a big load of expensive overhead, there’s no going back. As it is, we get a couple thousand donations per quarter averaging about $30 bucks each and there’s no guarantees we can cover this quarter’s expenses much less next quarter. We’re on a pay as we go system and we have zero employees.We just ask for enough to pay the bills. Throwing more money at the problem won’t solve it. [This latest glitch] was a technical issue and we just had to keep troubleshooting until we found it. And no, we’re not going to invite a bunch of strangers in to get their hands on our secure systems. John has been programming since he was 14 and he’s pushing 40 now. He built these systems and he’s an expert in them. And no, we are not going to throw out our software and rewrite it and no we’re not going to move on to some other database system. There are no guarantees that any other system can do a better job and not without hiring a staff to build and maintain it and that’s for sure. And we don’t have the financial wherewithal to do any of that anyway. Maybe if we had a couple million bucks at our disposal and a couple years to do it in we could build an iron-clad system. And maybe not. All I can say is, if someone else can do it better and cheaper, then please step right on up and get ‘er done!! I’ll bow out and retire. Thankyouverymuch. And no, we have no plans of taking FR commercial. I like it the way it is. Not sure I could handle getting rich. I’ve been unemployed for 8 months and uneligible for unemployment…. If I can give, you all can too…just a little…if we all did it would make a difference…. Clearly you have an agenda, you are a troll. I hope you get the zot for being annoying. So you want to drive another person away? That’s why this site is failing now. Why can’t some of you see that? A thread was started. I voiced my thoughts and BAM. iPhones, the terror of all LIEberals! This is a thread about concerns over FR’s continued existence and you’re upset that you can’t use your iPhone. You deserve to be insulted. Repeatedly. DJ MacWoW hates iPhones almost as much as he hates the gays. Growup. This is about FR’s survival. Your iPhone is petty and you have been told that by other posters as well. But yes, gears are in motion to create a hard-news site with a Free Republic affiliation. Eventual goal – a cable news network to the right of Fox. JimRob jumps in to say that they ain’t changing nothing and all the money is totally justified so shut the hell up and donate! Thank you all very much, but there’s absolutely nothing wrong with the system other than the fact that it runs on computers and that we run on a shoestring budget with no employees. It’s just me and John, Amy and Chris. I’ve been involved with computers since 1972 starting with the Univac and the IBM/360 and Digital’s PDP and VAX generations. Amy got started a few years earlier. John started programming when he was 14 and was a commercial programmer by 16. He was our C+ guru when we were in the software business. He introduced us to the Internet in the early 90’s before the browser had even been developed. I’ve been a programmer/analyst from the 70’s and also in programming/project management and data processing management and also owned my own software company. The one biggest thing we’ve learned in all these years is that computer systems have a tendency to crash. And when the inevitable happens, we don’t panic. We troubleshoot, find the problems, fix them and go on. Been doing it for nearly forty years. There is nothing wrong with FR. It’s perfectly normal for systems to fail occasionally. Now there are ways to make a system more bullet proof and to build-in back ups and redundancy, etc, so there is almost zero downtime for users, but these are usually reserved for critical operations. And that’s because they cost money. Lots of it. For example we only have one tech, one programmer, one hardware guy, one security guy, one operating system guru, one perl guru, one mysql guru, one all around computer guy and John is it. He’s also our chief procurement officer and liaison with all vendors and suppliers and in his spare time he fills in as our research and development department. Dear old dad with 40 years experience in programming and managing legacy computer systems tries to join in and help but usually just gets in the way. John is a one man shop, he’s on call, on duty 24/7/365 with no vacations or holidays unless he carries a cell phone and lap top and he likes it that way. We could hire three or four guys to do what John does and we still couldn’t cover it 24/7/365 and provide uninterruptible service. We’d still suffer downtime. We could also build redundant systems. But that just doubles the cost, doubles the maintenance and doubles or triples the capital requirements and ongoing expense. And unless they were located in different parts of the country on different providers, the redundant systems would not guarantee 100% uptime. Guess what? Even multi-million dollar fail-safe systems fail occasionally. Computers crash! It’s a fact of life and we deal with it every day. FR was started on zero capital. It was a hobby that has grown terribly out of control. It was a one man shop when I set it up. Amy came in later to help me administer it, then John took over the programming a couple years later and redesigned and rewrote it all at least three times since. He built the servers it runs on. Now it may be that if we had the money we could order all new equipment and redesign and rewrite the software again with an eye for making it all bullet proof, but that would require lots of money and probably hiring some additional talent and it would require time. But we have no money and no access to money. And we are reluctant to take on any additional debt. Now we could go commercial. We could sell ads. We could sell subscriptions or memberships, We could sell t-shirts and hats. But the moment we do, we invite scrutiny and copyright lawsuits. Before going commercial we would have to scrub our archives of any possible copyright violations. And we’d have to tighten up our current operations to make sure no one posts anything that could get us into trouble with any publisher of stories, photos, images, etc. And with sharks like Righthaven swimming around, there will always be room for trouble. And going commercial still wouldn’t guarantee enough income to build and maintain a paid staff, bullet proof software, redundant systems, etc. I’m an old dog and I like to keep it simple. We have a nice little system here. We are comfortable with the hardware and our software and our providers and it works fairly well. Actually, very well. We have some occasional problems and have been down a few times but as I said, there are no guarantees that if we had double or triple the size of our hardware or our staff that we still would not suffer some downtime occasionally. It happens. And we’re perfectly comfortable with donor funding at a shoestring level. I’d hate to complicate the thing by going commercial. We are grassroots and it makes sense to me to keep it all grassroots and uncomplicated if we possibly can. I see no reason whatsoever to panic about our systems our staffing or our funding. And I really wish to thank all of YOU who make it possible. Your donations provide the capital we need to keep it all going and your continued participation on our forums makes FR the premier God and Country CONSERVATIVE site on the Internet!! Thank God for the FReepers!! God bless you all. But is what JimRob saying accurate? Does it really cost $92,000 a quarter to run this website? That’s $368,000 a year! Where does the money all go? Stay tuned, dear readers, because the next post will explain where the money all goes! While I love the people who make up Free Republic, I have many complaints about Jim Robinson and his cronies who run the actual website. Over and over again, whenever somebody has complained or offered suggestions, they have been told by JimRob and others to go and start their own website if they know so much. Well, I’ve decided to take them up on that offer. The second reason is that I believe that free market capitalism has made America great, and that attempting any other system will lead us to ruin. A belief JimRob apparently doesn’t share, since he continues to refuse to place ads on Free Republic and instead depend on a PBS-esque donation system. We are not NPR, and we are not a charity – why do we raise money like one? For this reason, I’ve developed TrueBlueFreedom.com to depend on advertisements. TrueBlueFreedom.com will not depend on donations, instead, we will depend on the opportunities provided by the free market to create a self-sustaining version of Free Republic – without the constant Freepathons. 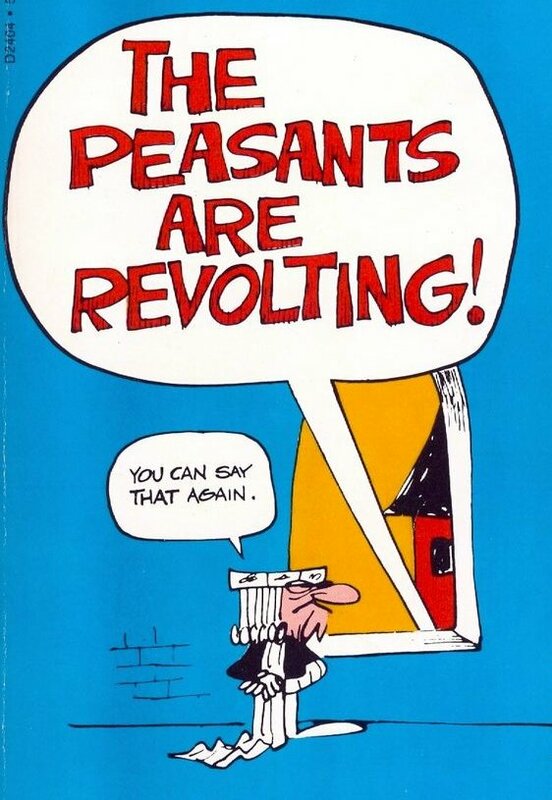 The third reason is that JimRob is, in my opinion, a petty tyrant. How many of you know somebody who was purged? How many wonder if you may be next on the list? If you’re neither of these people, consider this: Giuliani was America’s Mayor in 2008. 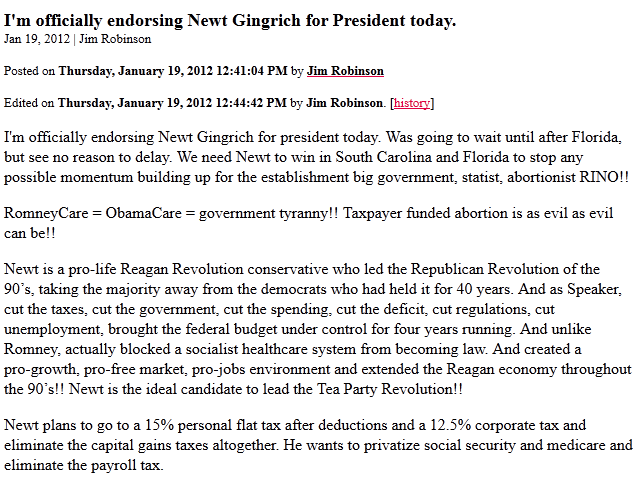 That didn’t stop JimRob from purging all his supporters without warning. 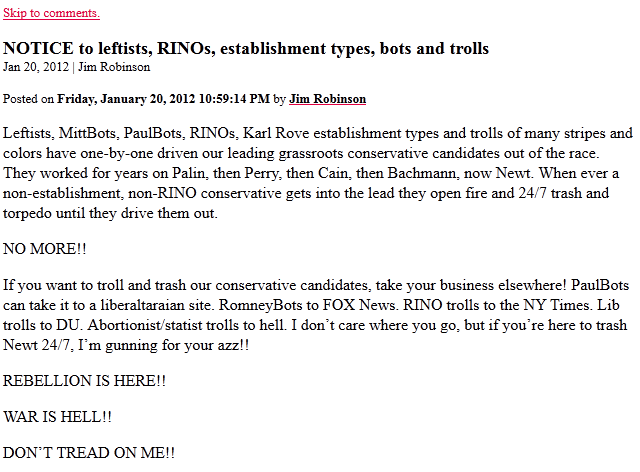 How do you know that whoever you support in the Republican primaries won’t raise JimRob’s wrath? How do you know the next purge group won’t be Mormons, Jews, Birthers, Pro-Palin, Anti-Palin, and so on? I believe that purging the non-believers and demanding total mental agreement with the “Dear Leader” is the exact opposite of conservative values, regardless of where JimRob stands on abortion and homosexuality. And for that reason, I’ve set up TrueBlueFreedom.com as a place where conservatives who follow the rules will not be banned, no matter how much I disagree with them. Regardless of your politics, religion, or favorite sport team, you will only be banned for breaking the rules. TrueBlueFreedom.com is a purge-free zone. So, I hope you’ve read all this, and will accept my invitation. If this seems like something you can believe in, come to TrueBlueFreedom.com, sign up, and start talking. And if you like it, spread the word. Because Free Republic is too important to just let die. This may bet interesting, so stay tuned!